Have you ever been browsing through comments on a Facebook post and seen one of those pictures that are cleverly composed of words to make recognisable shapes? Check out the screenshot below to see what I mean. 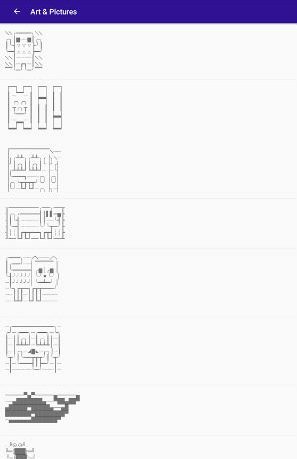 It is more widely known as ASCII or Unicode art and it has been around for almost as long as the keyboard, and there are now millions of them available for a quick copy and paste. Now, it may seem that the person that posted the clever comment is a bit of a genius, spending hours crafting their wordy creation, but the truth is that they probably grabbed it from one of a few online sources. Now, thanks to Tictures, available for Android through the Google Play store, you can be the one posting things that will make others wonder just how you did it. Tictures is a superb little app, and one that has found a home on my phone that it will probably never vacate. The only problem I have is that I wish there was more of it. The app allows you to view from a variety of categories, such as Happy, Sad, Love and Art. Once you click on an image, you can then choose to share it using your device’s built-in sharing options, or straight to Facebook Messenger which is a great option. You can also copy the image to your clipboard so you can paste it to just about anywhere that your phone can enter text. 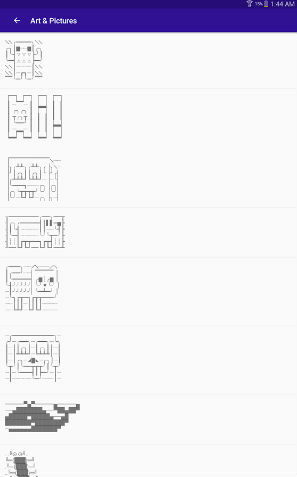 A great little touch is that the app allows you to actually edit the text, so you can add your own custom message to the top or bottom of the ASCII art. This will be brilliant for those looking to add a personal touch to the images, and there is also an option for adding a picture to a favourites list for easy future access. Now, the only real problem I have with the app is that I really wish there were more pictures to choose from. Yes, there is a section of the app where you can add your own, and the developer has a feedback option where you can ask him to add some that you find, but I do feel that there should be many more included as standard here. Hopefully the collection will continue to grow and this point will become moot; I will update the review if things change. I would also like an option to turn off the ads for a fee, which is an entirely selfish request as I would like to keep using the app in the future and I prefer apps ad free. Aside from those quibbles this does everything I could ask an app like this to do, and is a great tool for Reddit, where you can often find me lurking. Apps like this are what mobile apps should be all about in my opinion. A great little addition to other services and functions of the phone that you simply will not find built-in to any messaging app that I know of, this really feels like it belongs on a phone instead of being a substitute for other things as many apps are. It is strange how a tiny app like this can get me excited, but that is exactly what has happened, so congratulations to the developer for creating something so elegant and useful, and also for reminding me why I love apps so much.